Cats or Dogs? | Comparison Blog Post | You Decide! What’s Pet is Right for You? One of my favorite movies growing up was Cats & Dogs. The idea that animals actually have an ongoing secret spy war fascinated my young self. You know they made a sequel in 2010? I had no idea myself until I started researching for this post! I’ll have to peruse a copy online. In the film, I never understood why the fluffy kittens were the antagonists! I know cat videos dominate the internet. Everyone assumes they are evil, but maybe they are really just misunderstood? Both cats and dogs can show love and affection to us all! Some people have their preferences. Why exactly would someone choose one animal over the other? I think hating on one side is partly due to stereotypes. All cats don’t scratch up the sofa. Not all dogs bark constantly for no reason. Some folks also have bad memories. I remember a scary dog that hollered at me every afternoon coming home from kindergarten. Even younger than that, a stray black cat swiped my arm. The pretty acted all nice until it randomly didn’t want me to pet anymore. Poor thing must have been moody. Choosing a new pet means committing a lot of responsibility. You’re adopting an extended member of the family. 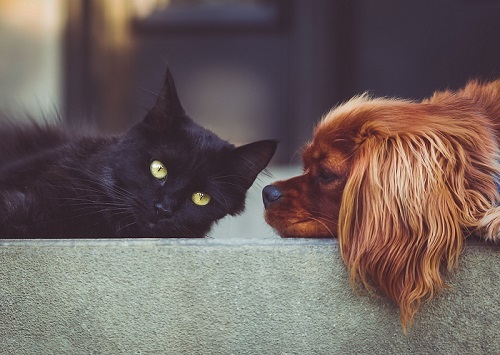 Just like chocolate or vanilla, the debate over cats vs dogs may continue forever! Thus, I created this post as a guide to outline the best qualities of both pets! The general public certainly sees cats in a less reputable light than dogs. They can appear mysterious, lethargic, and detached from their human overseers. In fact, people nuts peddle the conspiracy that cats see themselves as the masters and plot together to take over human society. Unlike most dogs, cats don’t need too much attention. All you have to do is feed them and change the litter. Otherwise, they can handle themselves. Cats love to explore on their own, nap in a safe corner, and chase critters. If cats don’t seem too interested in you, don’t take it personally! They like their space. When your kitten is comfortable or scared, he’ll come to you! You cannot force love. Like a flower, you got to let them grow on their own! Unlike other animals, you don’t need to place too many boundaries around cats either. Dogs could hurt themselves chewing stuff in the kitchen or your room. Cats, on the other hand, don’t seem to have better awareness. Sometimes though, you can forget they are in a room and they’ll moan to get out late at night! Since cats are independent, you really don’t need to train them as much as other animals. They’ll naturally want to use the litterbox. If they have a scratching problem, just a few harmless squirts of a spray bottle can easily condition the cat against it. You don’t need to wash a cat! In fact, trying to force a kitten in a tub would be most unwise. Relax! They constantly lick themselves clean! They might shed hair more than you prefer. You might want a lint roller on hand for your furniture and clothes. Otherwise, you can choose a short haired breed, like a beautiful Siamese! Since they do lick themselves often, they may barf hairballs. You can reduce the chances of this by brushing out knots and matted fur. If your kitty likes to go outside, you’ll want to brush him more frequently! You could also get a little cat bed for him, so he has a designated place to clean and wash.
Their independence doesn’t mean you cannot initiate a play session! Dogs will play with you for hours over anything, but cats are different. You need to start gentle pets and then maybe work your way up to sneaky spider hands! My cat likes that sort of thing and will try and pat my hand away. Cats love to chase after anything! If you shuffle your feet under the covers, they might try and catch them! You could also buy a number of fuzzy toys or even crazy laser light pens! Bottom line: cats like to bond through their playful hunting nature. Why not also connect through cuddles and movie? My Chomper and I (pictured above) love watching anime on my iPad! We also enjoy taking selfies together! Just remember not to play too rough! You must be gentle with your kitty! My Personal Exterminator – Chomper! I think the best thing about cats is their killer instincts! As you can see, Chomper has done me a great service eliminating pests! He slaughters creepy, yucky lizards, roaches, rats, and even birds – well okay, I admit, I was a bit dishearted see him murder a few chicks that fell from their nest. That’s natural selection though! Even if your cat isn’t strictly an outdoor one, your feline friend will serve as an added protection against nasty critters. Why waste money on roach traps, when you have a cat? Dogs have been man’s true companion for thousands of years, and it’s no wonder why! They are so many cute breeds of all sizes! Some dogs are short and fluffy, while others are large and a bit musky. What exactly makes dogs special? Glad you asked! Most canines are naturally very protective of their owners! They are very perceptive. Sudden noises in the middle of the night will likely set them off to scare off any intruders. Farmer use dogs to protect their livestock. Many people also specifically train dogs to protect their property. Training a guard dog is probably a lot of cheaper than hiring a personal bodyguard! Some dogs, like my baby Asher, hate all strangers. This behavior can make having guest over a nightmare. You should take the time to train your puppy at a young age to get them used to people. Use treats and the right tone to condition them around the right people! Dogs are Trained for All Kind of Jobs! Dogs are High Energy Playmates! Doggos, especially the pupper kind, have a hyper personality and love to play rough! You could play fetch or tug-of-war for hours! If you are an active person, a dog is the perfect pet choice. If you’re looking to improve your figure, a dog will help keep you moving! Even if you have a decent sized backyard with a fence, take your dog on walks every day! They’ll love it, and you’ll get a free workout! Check if your town has a dog park near you! More dogs equals more fun. You’ll also enjoy turning the outing into a chance to meet fellow humans. Dogs are truly man’s best friend because they have a huge range of emotions and love us unconditionally. People think cats are moody, but dogs easily develop trust and attachment to their owners. Dogs cuddle and comfort us when we need it most. Dogs don’t ever feel we’ve been too clingy. They certainly don’t judge our past. If we screw up at work, doggos love us all the same! When feel lost in depression and despair, doggos don’t walk away. What did we do to deserve dogs? Nothing! But that’s life. We are not entitled to anything and, in the end, we have control of nothing. When you realize everything is a gift, you’ll appreciate life as your dog does. Pet are beautiful little creatures. If you want beautiful writing on your website, consider hiring me for freelance writing services. Both cats and dogs are awesome in their own way! Which do you prefer? Tell us why below!